Well, I certainly didn’t plan to skip two weeks worth of updates. January just got extraordinarily busy, some of the details of which I’ll post in another update. Suffice it to say that I’ve had little time to write, but that I’ve been good and stayed on plan, even on days when I’ve had to be out of the house. It hasn’t been easy and my choices to just not eat at certain meals probably made the whole ordeal a lot more difficult for me in the short term, overall making the right decisions is what is most important. I tried to make a giant pot of turkey chili, hoping to freeze some of it, so that I could use it to help reduce future meal prep during the month. I had the meat browned and the other vegetables in the pot with Contadina crushed tomatoes. I had cans of Italian Herb Tomato Sauce from them but that wasn’t quite the flavor profile I was going for, so when I needed the chili to have a little more sauce I grabbed their original flavor tomato sauce. Surely the only thing different would be the lack of Italian herbs, right? WRONG. Third ingredient in: sugar. WHY? Why must everything be ruined by sugar? It wouldn’t have been a big deal but I had opened the can and dumped it into my chili before I read the ingredients. Several pounds of chili were now ruined for Whole 30 because of one 8 oz can of tomato sauce. I still managed to whip up a dinner in fifteen minutes after that fiasco, but there was a definite dark aura looming over me for several hours. It was my fault, though. I need to be more diligent in checking labels when I buy food. I can’t assume that similar products from the same company will have or omit the same ingredients. 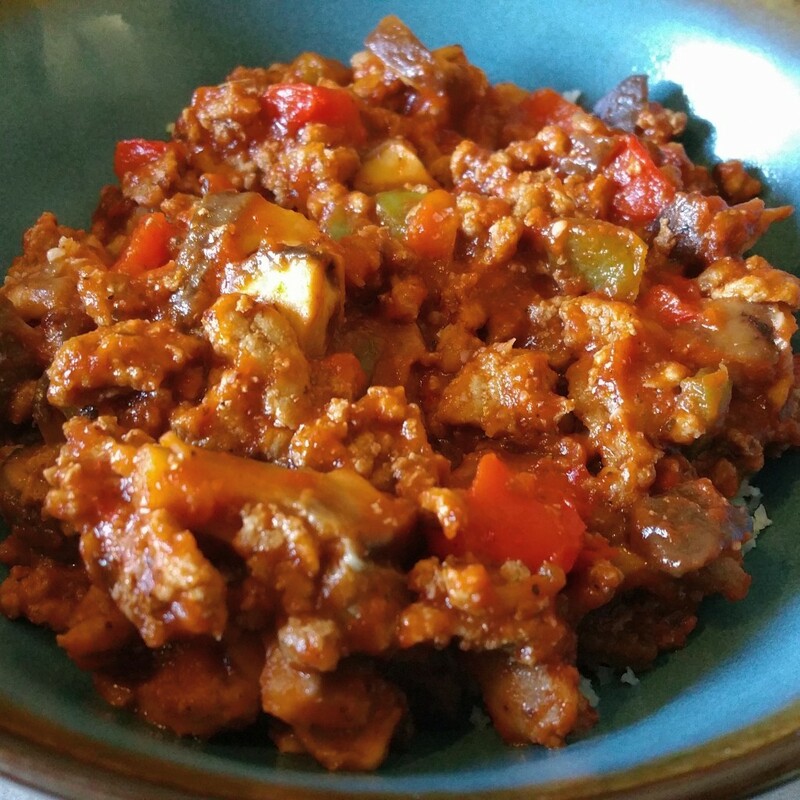 Later in the month I made a 30-minute turkey chili because, dang it, I wanted turkey chili. I had never eaten spaghetti squash before but I finally got the chance to make faux pasta with one and I loved it. 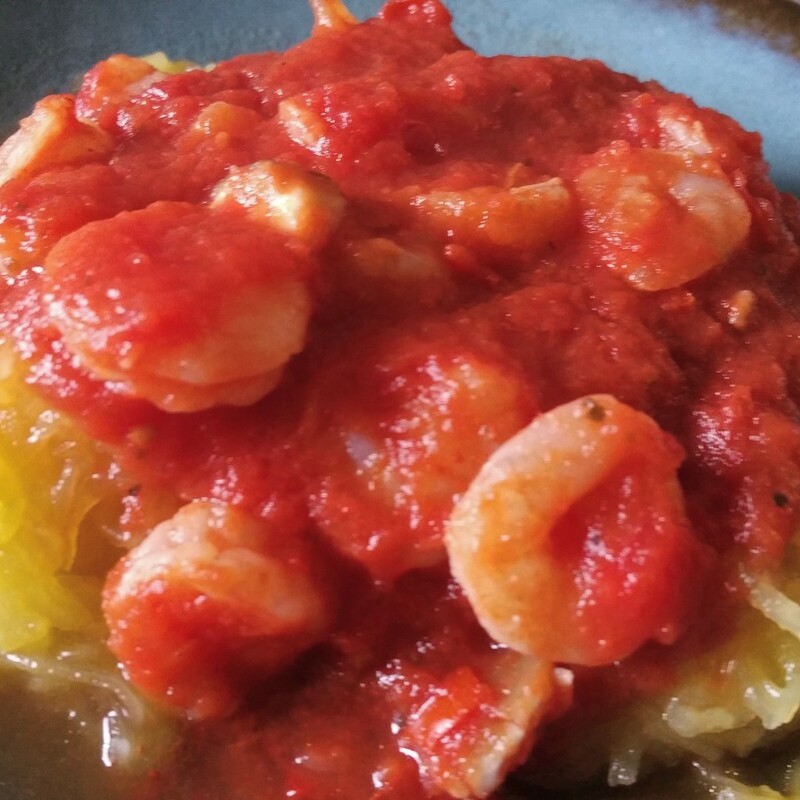 I served mushrooms and shrimp in a homemade marinara (all with approved tomato products, this time) over a bed of the squash with just a bit of ghee tossed with it and it was amazing. Anyone who knows me can attest that I am a huge pasta fiend but this substitute could make me forget that I could be using noodles instead. 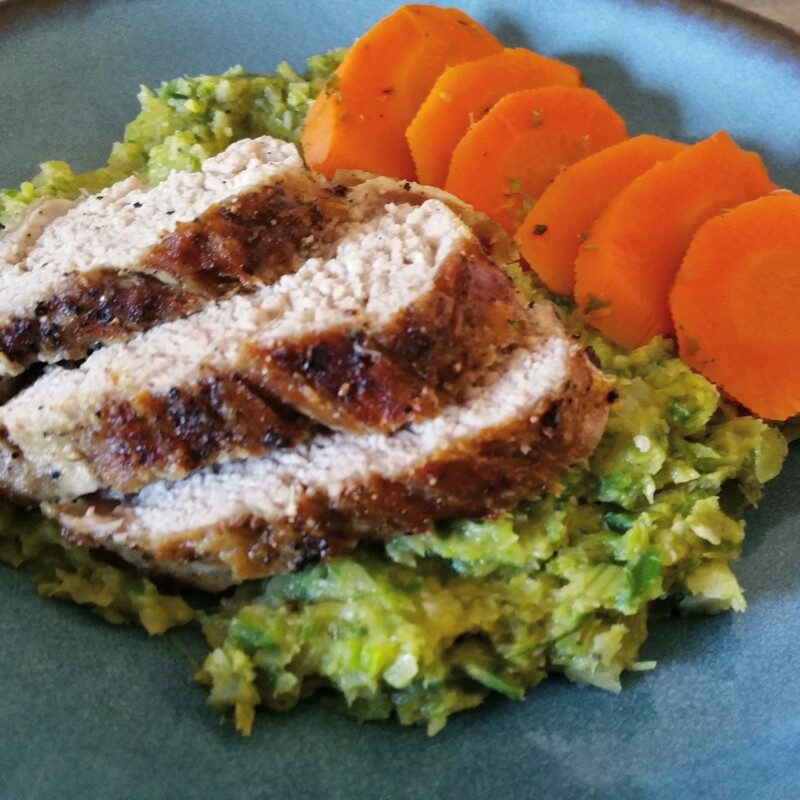 I also made an awesome pork tenderloin that only slightly got overcooked, but was still extremely moist and tender (just missing that gorgeous pink center). It is in a tie with the aforementioned spaghetti squash pasta for my favorite dish this month. 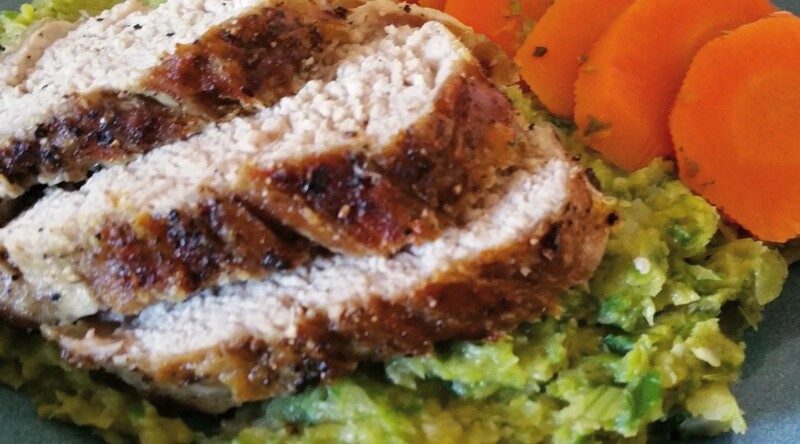 And I made the leek puree again to rest the pork on top of and the combination was spectacular. Leeks are quickly becoming a staple in the household. I also managed to eat out on several occasions. Twice at Jason’s Deli which were successful attempts at proving to myself that I can inhale more boiled eggs than should be humanly possible. Once at a Denny’s following a convention where I opted to just wait for dinner to even try to eat anything on plan. Our server was kind with my requests and put my salsa on the side so I could determine whether I thought I could eat it or not (he couldn’t tell me if it had sugar in it) and the cook staff graciously altered my veggie skillet (more eggs, less scrambling) so I could be sure of what I was eating in case something stuck out as being a potential problem. 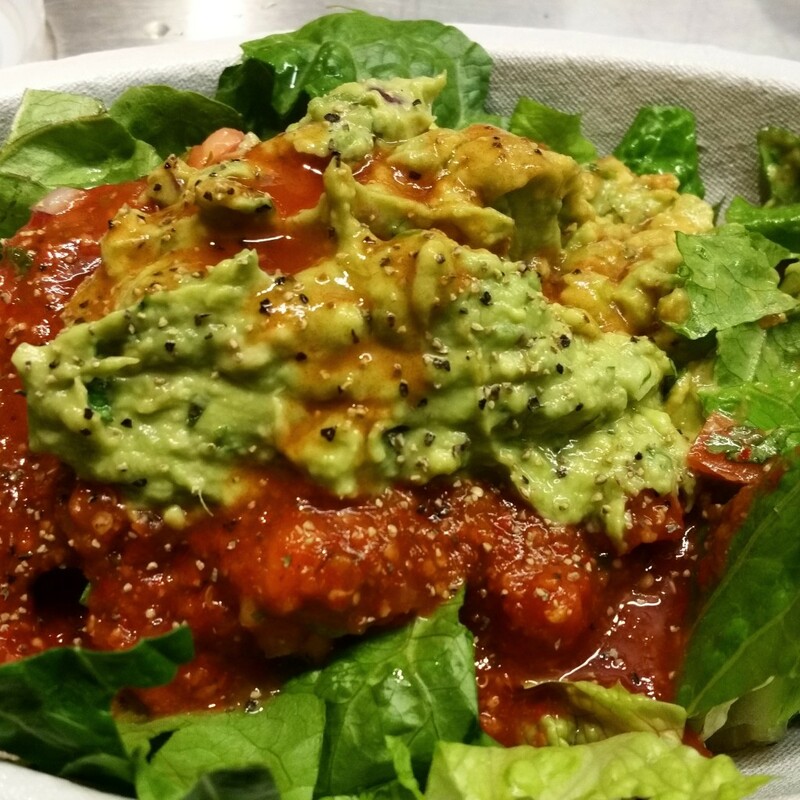 I also tried to eat at Chipotle because apparently the carnitas are Whole 30 compliant. This would have marked my first visit to Chipotle and I was looking forward to this magical experience that everyone always makes Chipotle out to be. Except apparently Chipotle has a nationwide pork shortage right now. So no carnitas for me. I opted for a veggie salad (hold the veggies, they’re cooked in forbidden oils) with guacamole and salsa with some tabasco sauce to round out the “salad.” Perhaps some day I’ll eat at Chipotle. Some day. Five more days until the Superbowl where I’ll officially be off my Whole 30 (31, really). 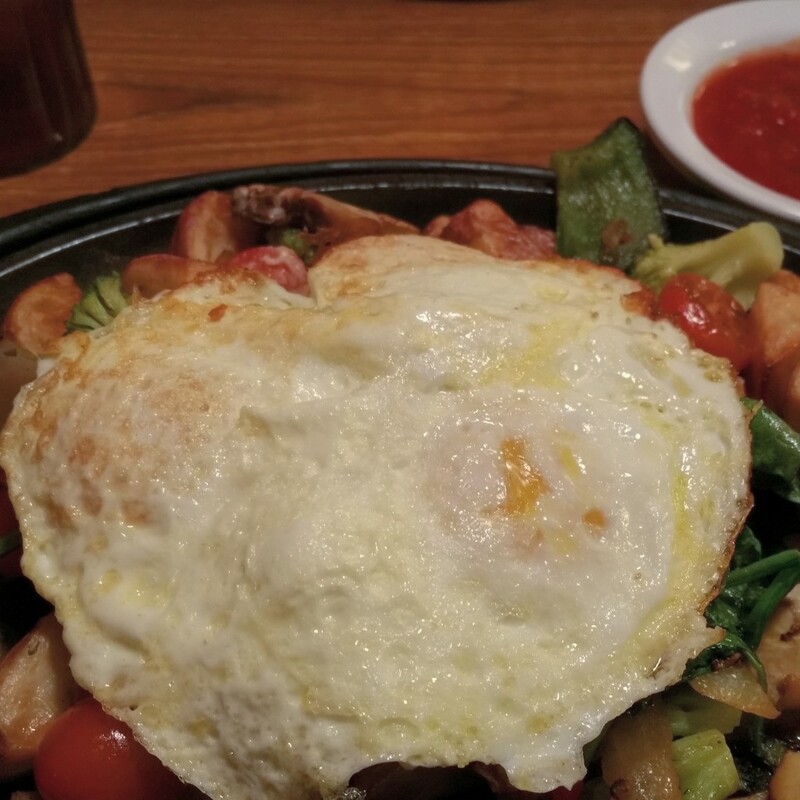 When I looked at the plan at first, I never would have dreamed that I’d really reach the end, but I’m almost there and it’s really made a huge difference on how I look at food. What an amazing journey.